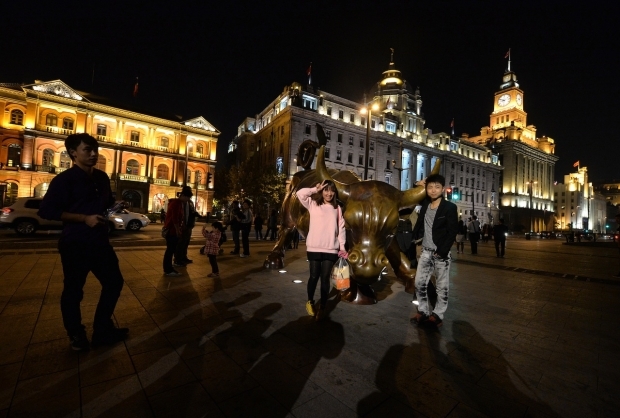 Visitors pose in front of a replica of the famous Wall Street bronze bull on Shanghai’s historic Bund on October 29, 2013. China’s ruling Communist Party will gather in Beijing from November 9-12 to discuss, among other things, a possible furthering of economic reforms. China’s economy is already two-thirds the size of the economy of the U.S., and it’s been growing five times as fast. But now, China’s economy is beginning to slow and is facing a raft of difficult problems. If China’s leaders don’t address these problems, the Chinese economic miracle could turn into a global economic nightmare. China’s best hope to confront and resolve these problems now, before it’s too late, is right around the corner at something called the “Third Plenum”—which Chinese media recently announced will take place November 9-12. Expectations are high. A Third Plenum in 1978 kicked off the entire reform era and began China’s opening up. In 1993, another Third Plenum outlined the comprehensive market reforms subsequently carried out by Zhu Rongji. At the upcoming Third Plenum of 2013, China’s new leaders will adopt a program of economic reforms that might, just might, keep them out of trouble and keep their economy growing for another couple of decades. There are four key things you need to know to be ready for the big event. And just as many key questions. What is the “Third Plenum”? It is a ceremonial gathering of the Communist Party elite which will adopt a document on economic reforms (and some other things). The important event is the unveiling of the document. This document is sure to be vague and couched in generalities; it will introduce new slogans that seem slightly meaningless to us foreigners. A wave of pundits will promptly proclaim it disappointing, because of its lack of substance. Don’t be deceived. The document will seek to redefine the relationship between government and the market after ten years of reform stagnation and regression. If it succeeds in pointing a clear direction, and creating some momentum, it will be important. President Xi Jinping’s credibility is on the line. He came to power promising economic reforms, and so far has delivered an anti-corruption campaign and a jumble of criticism/self-criticism meetings and ideological crackdowns. Without serious economic reform measures, Xi’s administration quickly will come to be seen as retrograde and, worse, irrelevant to China’s real economic problems. Xi has to deliver, and so the odds are that he will. What should we be watching for? A few important commitments will certainly be in the document: Gradually—perhaps over three years—China will liberalize interest rates, open up the renminbi capital account and let the renminbi partially float. However, these important changes are already “baked in” and implementation is in the hands of technocrats who can back off if things get rocky. Is there a clear direction for reform of local government finances? Will the Party take bold steps to reform land ownership? Will the Party move to abolish dual citizenship and give rural migrants full rights to live life as equals in the city? Will the Party boldly re-affirm the rights of private businesses and begin to scale back the privileges of state-owned monopolies? These are fundamental but complex issues where a declaration of principles is an appropriate starting place (and detailed programs are unlikely). This is where we should watch for progress in the Third Plenum. Stand by.